A new fragrance that celebrates the New York state of mind – boldly living out loud, making your own rules. All in. All the time. Made for the leader of the in crowd, Elizabeth Arden ALWAYS RED was inspired by the strikingly confident woman who radiates as she lights up the town. I love this perfume! I’m on my second bottle already. The fragrance is long-lasting, with an enchanting smell. It definitely feels like a night out. 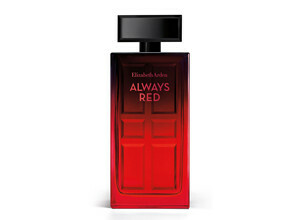 Elizabeth Arden Always Red is an exquisite floriental scent that’s slightly sweet thanks to the jasmine and praline chocolate notes. AR is modern, sensual, stylish and fresh with a sprinkle of fun. This is a great autumn/winter fragrance available in 30, 50 and 100 ml sizes. Sillage and longevity are great. Always Red smells sooo much like Si by Armani, it’s just slightly more spicy while Si is creamy. Nevertheless it’s an inexpensive alternative and great for everyday wear.